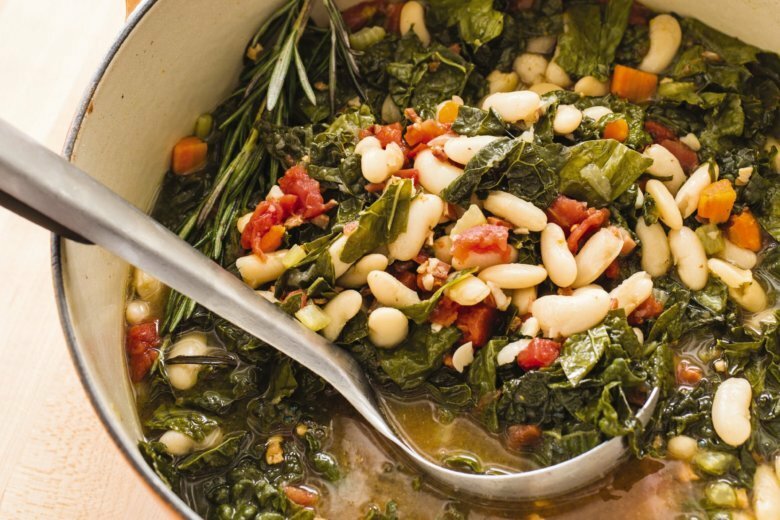 Zuppa di fagioli alla toscana is a quintessential bean dish featuring an aromatic base, hearty greens, tomatoes, pancetta and, of course, creamy, buttery beans. Soaking the beans overnight was essential to soften them so their interiors cooked up creamy. And salting the soaking water_essentially brining_softened the skins until they were barely perceptible for ultratender beans. After experimenting with cooking times and temperatures, we found that a vigorous stovetop simmer caused some beans to explode, so we gently cooked them in a 250 F oven for even results. Adding the tomatoes toward the end of cooking ensured their acidity wouldn’t toughen the beans. Adjust oven rack to lower-middle position and heat oven to 250 F. Cook pancetta and oil in Dutch oven over medium heat, stirring occasionally, until pancetta is lightly browned and fat is rendered, 6 to 10 minutes. Stir in onion, carrots, and celery and cook until softened and lightly browned, 10 to 16 minutes. Stir in garlic and cook until fragrant, about 1 minute. Stir in broth, 3 cups water, bay leaves, and beans and bring to boil. Cover, transfer pot to oven, and cook until beans are almost tender (very center of beans will still be firm), 45 minutes to 1 hour.